To anyone with even a passing interest in the development of mainstream comics over the past – gulp – 30-odd years, editor Karen Berger will need no introduction. So when she left Vertigo ahead of the restructuring and relocation of DC Comics back in 2013, there was much wailing and gnashing of teeth over the loss of one of the industry’s most influential guiding hands. And, not unnaturally, a lot of those frowns turned upside down when Dark Horse announced last year that she’d be returning to head up her own imprint at the publisher. Berger expressed her excitement about planning a “new line with top, diverse creative talent and exciting original voices”. As it turned out, quite of a few of those “exciting original voices” were hauled up from the out-of-print limbo into which some of her Vertigo projects had fallen. 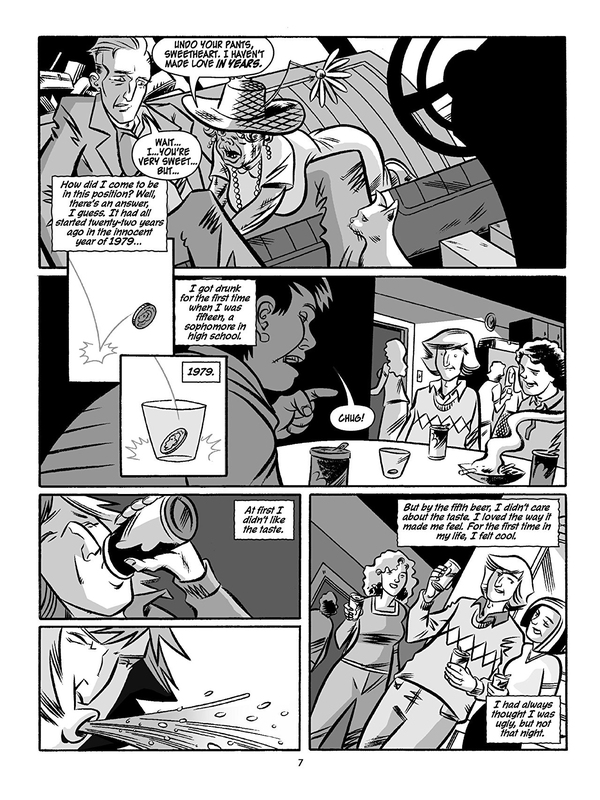 Without wanting to throw any shade on The Alcoholic in particular, it begs a question: as we become increasingly aware of the chorus of talented voices crying out to be heard in comics, is a reprint of work by two very established and mainstream white blokes ‘the way forward’? 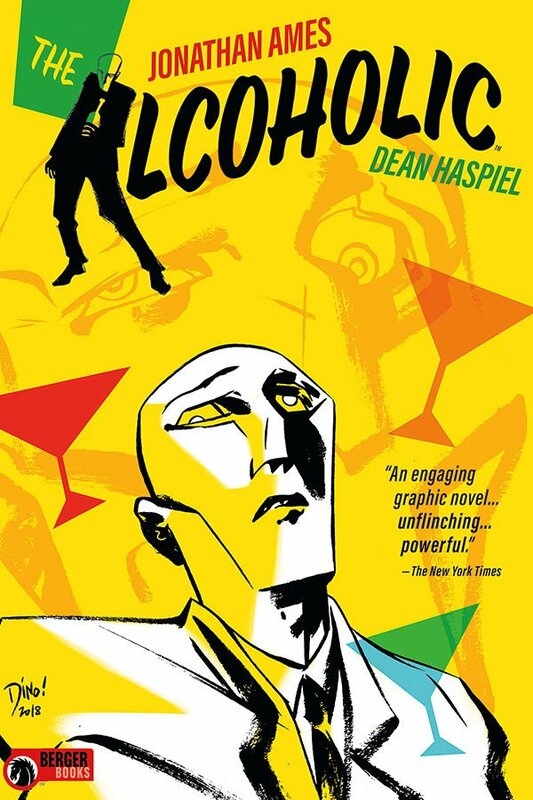 Published by Vertigo almost exactly a decade ago, The Alcoholic is a collaboration between author Jonathan Ames and cartoonist Dean Haspiel. A work of fiction with autobiographical elements, it skips back and forward in time to get under the skin of one Jonathan A – a successful writer whose vulnerability to compulsive behaviour flings him down a number of dark alleys, including the addiction from which the book takes its title. Along the way, the digressive style of the narration pulls in other strands of Jonathan A’s life, suggesting that his predilection for crawling into a bottle is only one part of a pathology of dependence that would fill a clinician’s clipboard. With characteristic brio, Ames instantly and disorientatingly throws the reader (along with the protagonist) into a rather sticky situation – and one that soon attracts the attention of the local constabulary and necessitates a sharp exit. 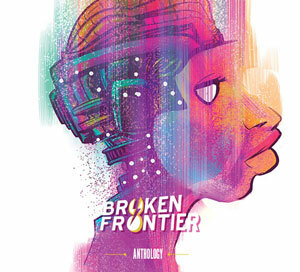 From there, with an arm-round-the-shoulder conversational style that draws in the reader and makes them complicit, our narrator takes us back to his adolescence and the origins of the unhealthy relationship with grog that has brought him to his current sorry state. As well as pulling off the role of a high-functioning juvenile alcoholic, the young Jonathan A has to negotiate the usual teenage hazards of fragile friendship, emerging sexuality, loss and grief, and thinking about what you might want to do for the duration of your wretched time on this benighted earth. His choices lead him – eventually – to a successful career as a novelist and columnist, but also plunge him into an increasingly intoxicated netherworld of dependence. However, as we catch up with where we started, Jonathan A realises that even the best of us can’t remain buried in sand under a New Jersey boardwalk forever. As the sun rises on a new day, he returns to the Big Apple and the not inconsiderable complexities of his current life. As Jonathan A finds himself enmeshed in one particularly sticky but doomed relationship and engages on a disastrous engagement as a writing teacher at an elite girls’ school, the months of 2001 tick down with an awful inevitability until we get to September. In the aftermath of the World Trade Centre attack, he again feels the need to get his life under control. However, he instead finds it spinning rapidly out of his grasp – epitomised by a terrifying ganja-fuelled confrontation on a Caribbean beach. When the dust settles (literally), and fortified by the strength and wisdom of his much-loved and spirited elderly Aunt Sadie, Jonathan A concludes the book with fresh insight and a resolution of sorts. 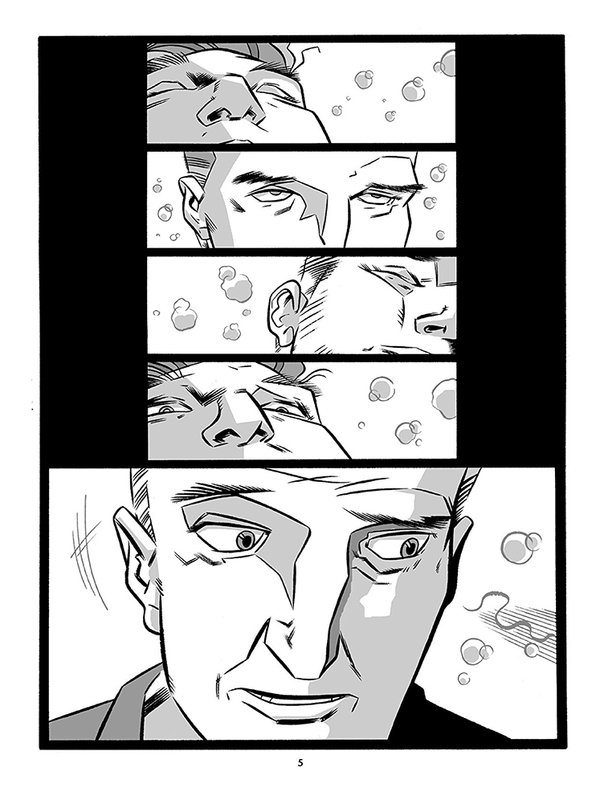 However, Ames and Haspiel then land a narrative left-jab-then-right-cross on the last page that suggests his struggles may not be over. 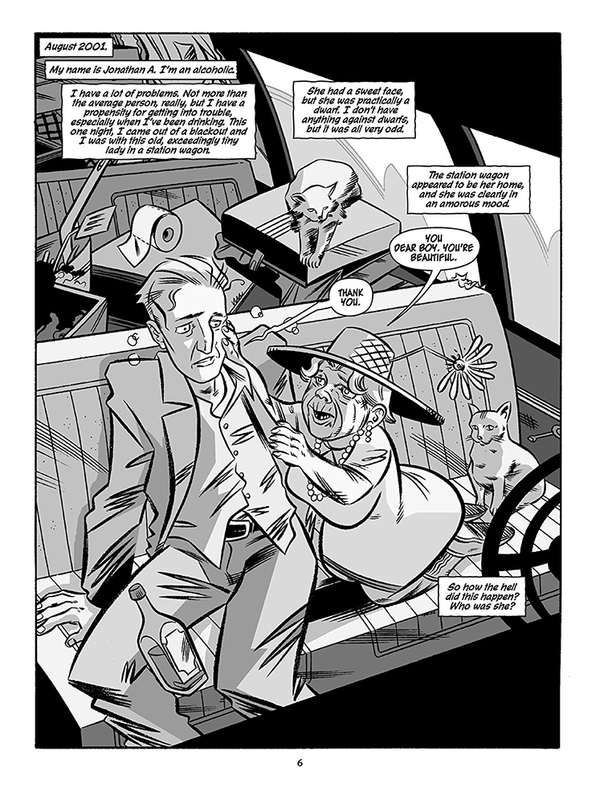 As a newcomer to comics, Ames puts much of the storytelling in the very capable hands of his collaborator, Dean Haspiel (and the entertaining new essay added to this anniveirsary edition tells how their friendship and collaboration came about). The fact that the book is mostly based in the Big Apple plays to the strengths of the artist, whose love for his home city was most graphically laid bare in Beef with Tomato. His robust style grounds us in the physicality of Jonathan A’s turbulent life, but slips more easily into a more expressionistic mode when things start to get out of hand. 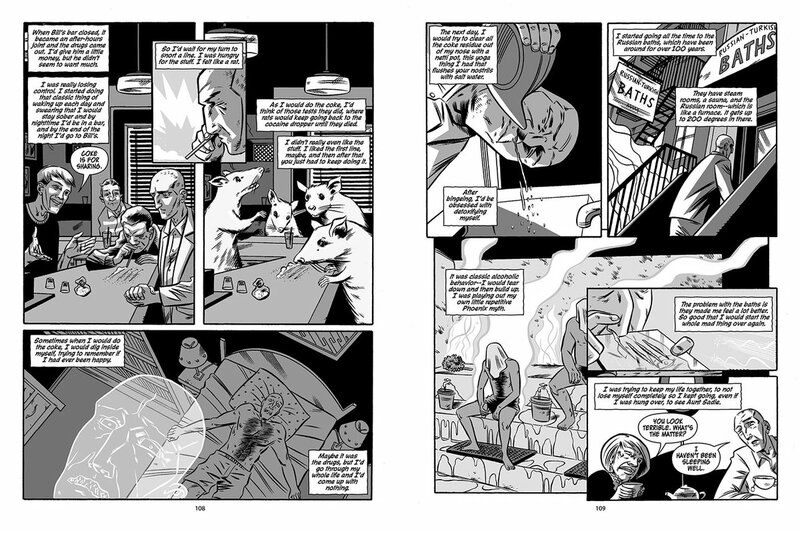 Meanwhile, it might be unusual to hail the colourist of a black-and-white book, but Lee Loughridge deserves plaudits for the depth he adds to the pages with his greytones. At first glance The Alcoholic certainly looks like a self-absorbed bit of dude-lit. However, look beyond the specifics and you’ll find enough wit, warmth, honesty and insight into the universal nature of addiction to overcome that narrow focus. But let’s hope that Berger Books are prepared to take a few more risks in future. Staff Picks for March 6, 2019 – Guantánamo Kid, Hicotea, Promethea, Ronin Island and More! Staff Picks for January 25, 2017 – Comic Book Slumber Party’s Deep Space Canine, Kamandi Challenge, The Dregs and More! Staff Picks for April 26, 2017 – A Thousand Coloured Castles, Roughneck, An Exorcism, Aliens: Dead Orbit and More!